While the Lego Architecture Studio includes a great selection of bricks for creative architectural sketching, I found the selection of bricks is lacking in two main areas: bricks needed for advanced building techniques, and specialty bricks for accents and detail work. Over the course of my Lego Architecture Studio 30-day challenge, I’ve identified the top 10 bricks that were not included in the set but should have been. I used specialty bricks which were not included in the Architecture Studio set for many of my challenges. Later in this article, I’ll teach you how to buy these bricks to augment your Architecture Studio. The Technic 1×1 and 1×2 bricks are very versatile for two reasons. 1) They allow you to attach a normal stud at a 90 degree angle allowing SNOT construction. 2) They have a hollow stud on top which allows you to attach bricks on top with a 1/2 brick offset. I used a couple of 1×1 bricks to attach the sign to the top of my #17 Art Deco Theatre model. The set includes a nice selection of 1×1 and 2×2 round bricks. I don’t know why they didn’t include some cones to add some nice accents to your models. I used the 1×1’s for light fixtures on #22 Craftsman home and #20 Castle, and I used the 2×2’s for the lamp in #8 Furniture. Flags make excellent accents to buildings, and they can also be used to represent tapestries or hanging art in your models. I used them for wall coverings inside rooms in #28 Living Room and I should have used them to decorate #20 Castle. Sometimes you need a slender component when building a detailed or microscale model. I prefer the versatility of the bars which can be inserted into a jumper to use it vertically, or held horizontally with clips. I used these in several models including projects #30 Library, #26 Ski Lodge, #22 craftsman, #11 skyscraper and #8 furniture. I used these in most of my projects, notably for light posts in #22 craftsman and to attach the castle to the baseplate in #20 Castle. The Architecture Studio includes a good number of this brick’s cousins with studs on more sides (4733 or 47905), but I find the simplest version with an outward facing stud on just one side to be the most versatile, because the second stud on the version with studs on 2 sides can get in the way when you don’t need it. The Architecture Studio set includes plenty of the more common 4070 Headlight brick (also known as the Erling brick), but I find the 1/5 brick indentation to be unattractive and inconvenient. I just got these, so I haven’t been able to use them yet! I used these to attach the ski racks in #26 Ski Lodge and to attach the wall-mounted lights in #30 Library. They can be a substitute for a hinge in some instances. Prominent use of tiles included the gate for #20 Castle, the sign and sidewalk in #17 Art Deco Theatre, and were critical for #5 Shed home. It boggles my mind that the set included so many bricks but absolutely no hinges whatsoever. Each type of hings offers the ability to bend your model in different directions. For example, the 2429/2430 hinge is great to build walls in unorthodox angles, and I have found the 60478/63868 hinge to be incredibly useful for building large peaked roofs using common plates, and the 44301/44302 locking hinges are nice as they click into specific angles for more strength. Examples of their use include the roofs in #27 Rustic Cabin, #22 Craftsman, #5 Shed home or in the front-facing SNOT facade for #17 Art Deco Theatre. Suffice it to say, the set should have at least included a white 16×32 or 32×32 baseplate. I really like using a colored baseplate with these stark white bricks, so you might also want a green or blue baseplate. Almost all of my projects used at least one baseplate! Where can I buy specific Lego bricks? There a couple of ways to buy these crucial “missing bricks” to make your architecture studio more versatile. Before you go any further, I encourage you to make a list of all the parts you would like to acquire and the # of each brick you would like to buy. This will help you decide where to shop. Lego’s online pick a brick website has many bricks to choose from, and you are guaranteed that they are brand new. Unfortunately, the selection is much more limited than bricklink, and the prices can be inflated. How should I sort all these bricks? I’ve already posted an article describing my portable Lego Architecture studio, so I’m not going to do that again. 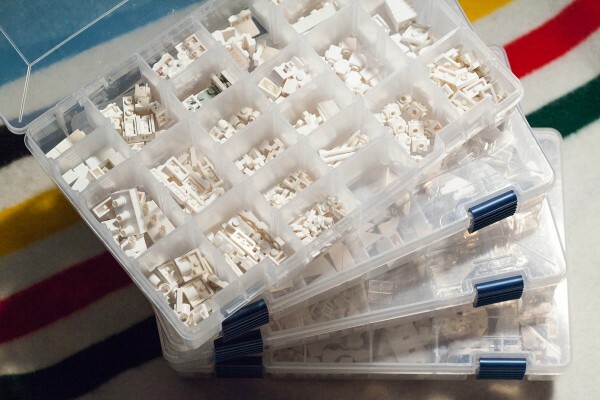 I did want to mention that I’ve added 4 small Plano boxes with adjustable dividers to organize my small specialty bricks. Each box has a focus: hinges, SNOT connections, Slopes and Trans-clear bricks. Most of my specialty bricks are now sorted into these boxes. 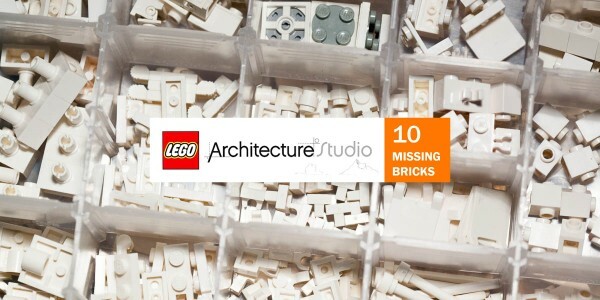 While I’ve already called out the top 10 bricks which are “missing” from the Architecture Studio set, there are many more bricks which may make a valuable addition to your collection. I’ve decided to include the longer list below as it might help you acquire additional bricks which will enhance your creative opportunities. Next story Make lots of money by buying and reselling used LEGO! Thanks for this. I have bought some extra parts but I need/want loads more. This list is great. Thanks for the list, I found it very very useful (and again will) when ordering some needed parts to expand my Architecture Studio. Overall, some nice reading in your blog, thanks for inspiration! FYI, the link to the portable architecture studio article repoints back to this page. 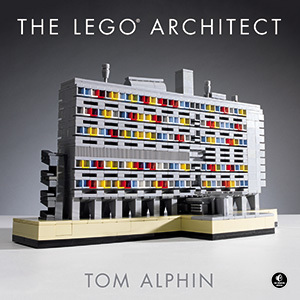 Interesting , really thanks for this, I just found your website, searching about Lego architecture estudio, I have one and i was searching for inspiration. Do you have an xml or bricklink file of your long list of desired added bricks? I do not have an XML file at this time. The best way to do this is to make your own wishlist based on the parts you have and the additional parts you want. This is easy to do using the BrickStore app. Richard, thanks for pointing out the broken web link. I just fixed it! Thanks again Tomfor all you do for the Lego community, 3 more Akro-Mills to be delivered today. The wallofbricks link is no longer active. There is ‘Pick A Brick Wall Exchange Group’ on Facebook.